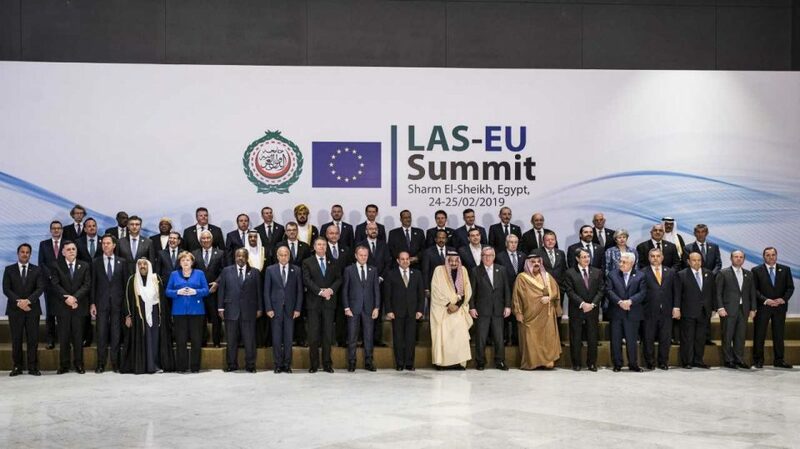 The first ever League of Arab States (LAS) and European Union (EU) Summit took place on 24-25 February in Sharm El-Sheikh, Egypt, bringing together 49 countries’ representatives. Leaders from the 28 EU Member States and the 21 countries of the League of Arab States, as well as the Secretary General of LAS, were also invited. The High Representative of the European Union for Foreign Affairs and Security Policy/Vice-President of the European Commission, Federica Mogherini, and Commissioner for European Neighborhood Policy and Enlargement Negotiations, Johannes Hahn, also participated at the event. Hinting to the summit, the ambassador of Arab Republic of Egypt in Kabul Hany Salah said that his country was playing the role of a bridge between the Arab world and that of Europe, adding the summit was the first of its kind and the second would be held in Brussels in 2022. “The mass presence of representatives and heads of states reflected the success of the summit and showed how important it was for the two sides. Interactions between Arab nations and that of the Europe have taken place for hundreds of years, where Egypt is the leading country in Arab world,” the ambassador said, adding the final statement of the summit emphasized on importance of holding such meetings and the ability of Egypt to host such big events. According to declaration, the summit discussed and addressed common and current challenges across the two regions comprising 12% of the world’s population and emphasized on a new era of cooperation and coordination; confident that strengthened interaction between the member states of LAS and EU would have great potential to enhance the stability, prosperity, and well-being of the two regions and the world at large, working in tandem within the multilateral, rules-based global order. “We acknowledged our rich history of cultural exchanges and strong partnership, and reaffirmed that stronger regional cooperation is key to finding solutions to the current common challenges which both the EU countries and the Arab States are confronted with,” the declaration read, expressing their determination to move forward with deepening the existing strategic partnership among their countries at the Summit level as well as other existing mechanisms of cooperation. “We also expressed our commitment to share experiences and further deepen the Euro-Arab partnership in order to realize our shared aspirations, to promote peace, stability and prosperity, guarantee security, foster economic, social and technological development and to create mutual opportunities through a collaborative and cooperative approach, placing the people of our regions, and in particular women and young people, at the center of our endeavors. We recognize the important role of civil society in this regard. “We renewed our commitment to effective multilateralism and to an international system based on international law in order to tackle global challenges, including through increased cooperation between the LAS, EU, the United Nations (UN) and the African Union (AU). We reiterated our full commitment to the universal 2030 Agenda for Sustainable Development,” the declaration of the summit added. The summit also had constructive, serious and thorough discussions on recent developments in Syria, Libya and Yemen, and on ways to make progress towards reconciliation and sustainable and peaceful political solutions, in line with relevant UN resolutions. They affirmed the need to preserve the unity, sovereignty, territorial integrity and independence of these countries. The participants reaffirmed their commitment to the UN-led processes and our full support to the UN Special Envoys for Syria and Yemen and to the UN Special Representative for Libya. On Yemen, we welcomed the Stockholm agreement in particular the ceasefire on Hodeidah, and the adoption of the UNSC Resolutions 2216, 2451 and 2452. We recalled our concern for the dire humanitarian situation where millions are gravely affected, and called for the safe, rapid and unhindered delivery of humanitarian aid and personnel, and of commercial supplies, to those in need, and called upon all concerned parties to work constructively towards a lasting and inclusive political settlement for the benefit of the people of Yemen. The summit also exchanged concerns on threats to international and regional peace and security, including terrorism, radicalization, destabilizing actions, proliferation, illegal arms trafficking and organized crime. “These are serious challenges that require concerted efforts, in accordance with international law, including international human rights law. We acknowledged that peace and security, human rights and economic and social development are mutually reinforcing, the declaration said. The joint summit reaffirmed their resolve to combat cultural and religious intolerance, extremism, negative stereotyping, stigmatization and discrimination leading to incitement to violence against persons based on religion or belief and condemn any advocacy of religious hatred against individuals that constitutes incitement, hostility or violence, including on the internet and social media. The participants agreed to hold LAS-EU Summits regularly, alternating between Arab and European states, the next one would take place in Brussels in 2022.